Logitech has announced the availability of its new Logitech Wireless Drum Controller for PLAYSTATION 3, which designed to let gamers take advantage of all the newest features of popular Guitar Hero games, featuring 3 fully adjustable premium drum heads with recessed rims, 2 cymbal pads, and a kick pedal using stainless steel surface and adjustable spring, delivering a highly durable, responsive drumming experience. 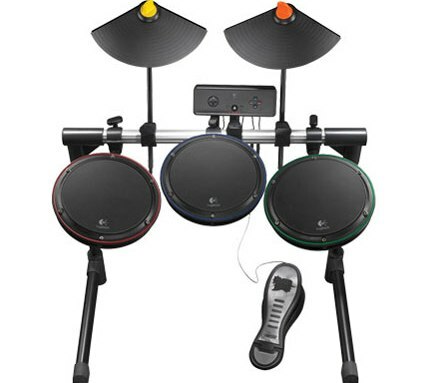 Logitech Wireless Drum Controller that utilizes a 2.4 GHz wireless USB receiver to connect to PS3 system without wire is able to support up to 50 hours of battery life on 2x AA batteries. The new Logitech Wireless Drum Controller that compatible with PS3 as well as PS2 gaming consoles is expected to be available later this month for around $200.